In the last few days leading up to, what in our minds was, the glorious start of Autopista End Nathaniel and I have had some bad luck with our bikes. It started when he took his bike to a mechanic in Sacramento and had them do a complete overhaul to get it ready for the trip. New air filter, new tires, new chain, they made everything new and shiny and perfect so of course it had to malfunction. Less then two miles from the mechanic’s at 7:30 at night the bike started sputtering and eventually ceased to be ridable. Good piece of advice, AAA will only tow motorcycles if you have the premium service, so make sure and plan ahead if you have a motorcycle. 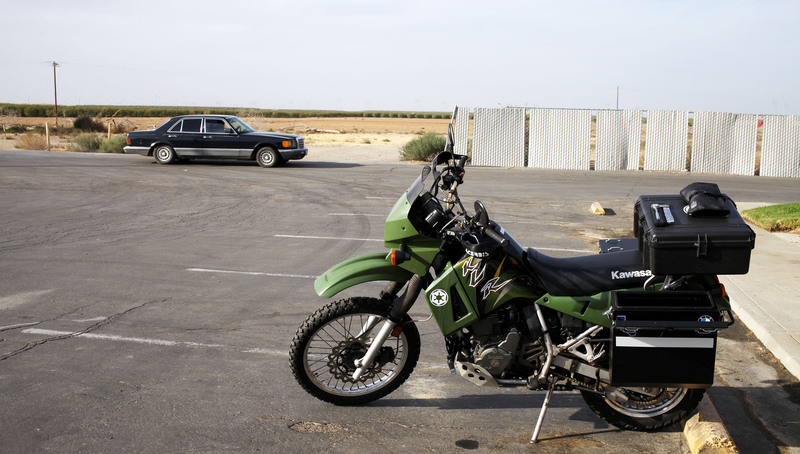 Nathaniel took the KLR back to the mechanic the following day and eventually the guy told him a piece of hay had somehow gotten into the intake valve – they removed it, flushed out the system, and it seemed to ride fine. The day he got his bike “fixed fixed” (Saturday) my chain snapped on the freeway just hours after someone told me it was too loose. I was told that a chain breaking while you are riding can be really dangerous but thankful nothing happened and a Kawasaki dealership near my house had an extra chain. We are not mechanics. Before a month ago we had never taken any type of tool to a motorcycle. 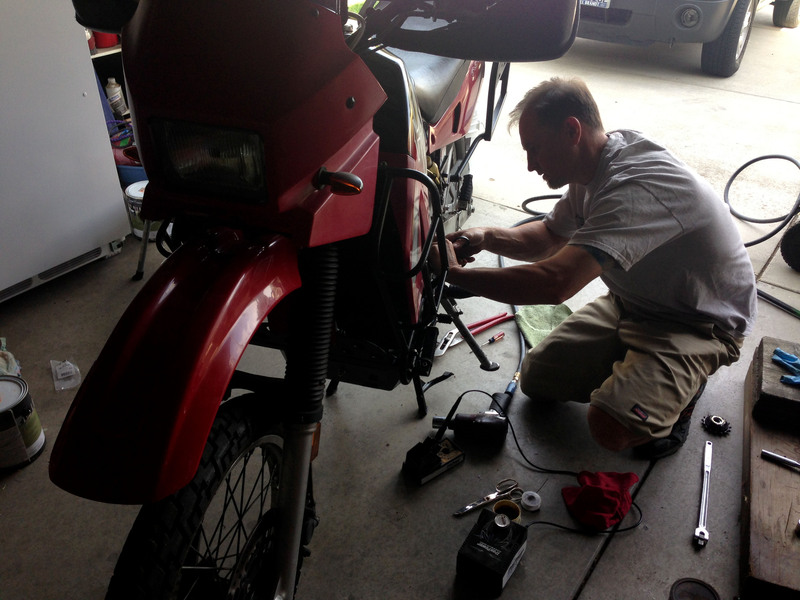 However, Sunday we replaced my chain and sprockets in my garage with some tools donated by my wonderful neighbors. One of them is actually a mechanic by trade and he was awesome babysitting us through the process! Anyways – these issues kicked our departure date back from the 7th of October to the 8th. This morning we got on the road around 9:30 and started cruising south on I-5. Our goal was to take a break and get something to eat after hitting 150 miles. Somewhere around the 60 mile mark Nathaniel’s bike started sputtering again while cruising at 70 mph. After a brief stop to discuss the situation and have our first bike tip-over of the trip (Nathaniel) we decided to try and hit the 150 mile mark and assess our options. We ended up on a beat up patch of asphalt just off I-5 called Coalinga. After talking on the phone to the mechanic who had worked on Nathaniel’s bike in Sacramento we decided to try a few fixes ourselves. We spent about an hour and a half next to Denny’s disconnecting the tachometer and playing with a few other things before calling it quits and heading to the nearest Motel 6 (which happened to be just a block away). By this time the winds had shifted and the smell of cow was strong in the air. After some fruit loops for dinner (thanks Chevron!) our spirits are a little higher and we have plans to take Nathaniel’s bike to a mechanic first thing in the morning. Sorry for the blandness of this post… Hopefully we will be eating fish tacos within 48 hours! And always remember, even if its not part of the plan, it’s always part of the adventure. Well I hope tomorrow the mechanic will be able to finally get Nathaniel’s bike “fixed”! Best if luck tomorrow guys!! Sorry to hear about motor trouble so early in your journey. Hope it’s very minor and easily corrected. Stay safe, positive and enjoy your adventure of a lifetime. The good news may be that you are getting all the kinks out early for a long fruitful adventure to come. I am not sure who the machanic was who worked on the bike in the first place but does he normally work on KLRs? Crazy bad luck, those bikes are normally bullet proof…Dont let it get you down, make the best out of fruit loops! Sounds like the craziness of the adventure has already started off rough glad you figure it out. FYI I highly recommend AMA Motow service.